1. It's surprisingly short. 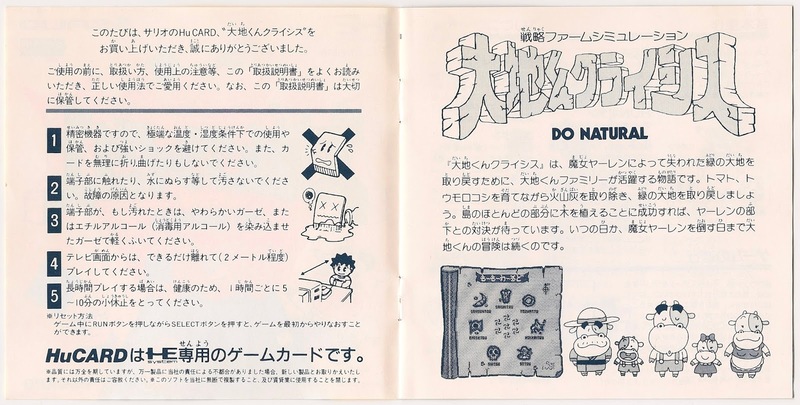 If you include the page that tells you not to bend or pour water onto your HuCard, the Daichi-kun Crisis: Do Natural manual consists of six whole pages. That surprised me because this game is made up of a few components. One part of it is a simplistic life sim; another part leans toward the tower defense genre. I can't imagine all of that is easy to explain in just five small pages of text. 2. I imagined it would feature a lot more cow illustrations than it does. 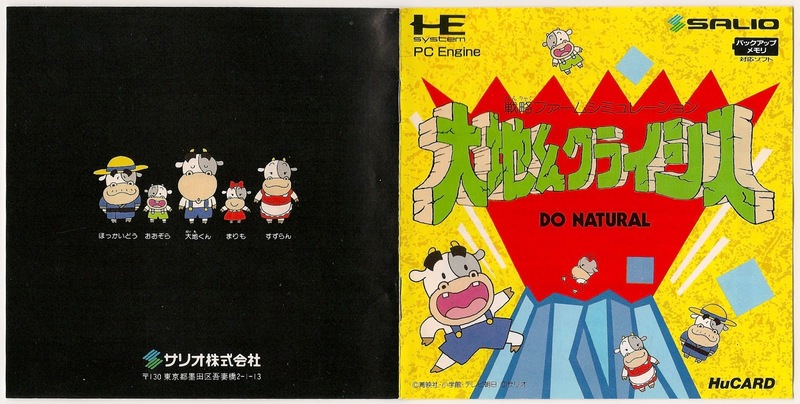 Seriously, the main characters in Daichi-kun Crisis: Do Natural are anthropomorphic cows--as well as a bear and crow with similarly human-like characteristics. 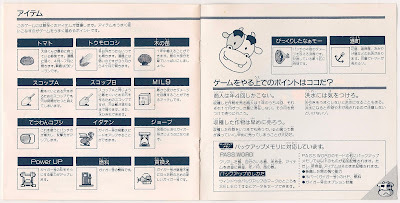 Given that, I assumed its instruction booklet would be heavily weighted toward adorable depictions of said wildlife. 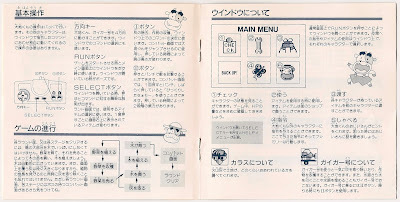 In reality, besides the examples that are slapped across the manual's front and back covers, only a couple can be seen on its interior spreads. 3. It doesn't offer up a single screenshot. Some might say this is for the best, as black-and-white screenshots from this era tended to be the opposite of eye-popping. Even if that weren't true, they probably wouldn't have properly portrayed Daichi-kun Crisis: Do Natural's colorful (if a bit rough-hewn) landscapes. 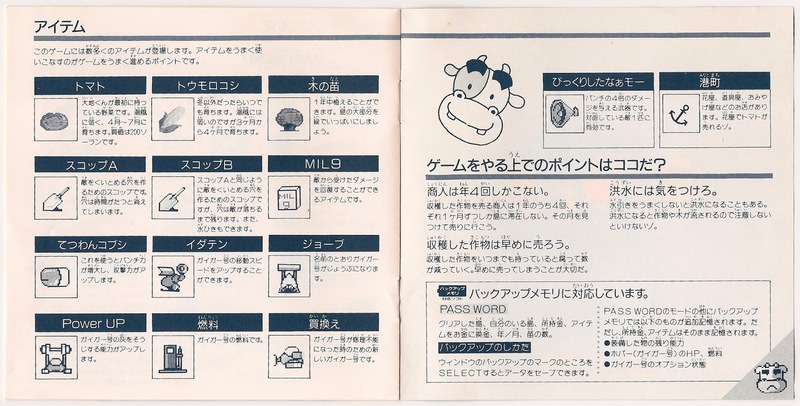 In other words, I probably should be happy this booklet sticks to text and the odd illustration. 4. 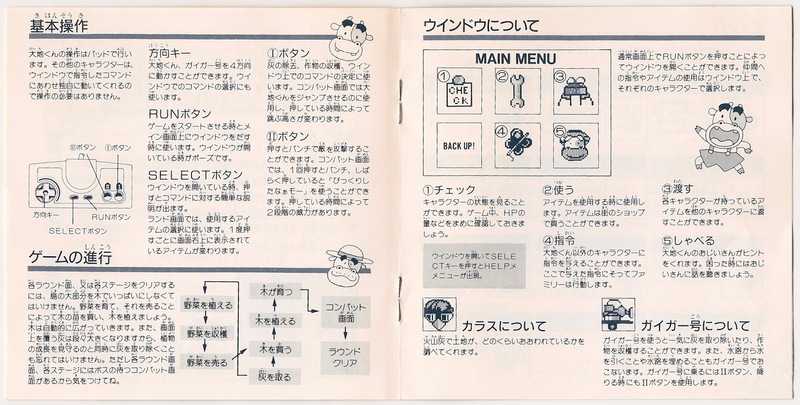 As much as I like the second-to-last page's item art, I would've preferred drawings. 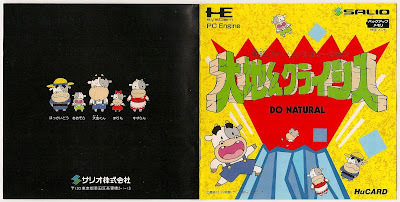 Seriously, it would be difficult to argue that the folks at Salio took the easy way out while producing the Daichi-kun Crisis: Do Natural manual. Granted, the company may have had just a handful of staffers when it made this game, so maybe my criticism is out of line. Surely its in-house or even outsourced artist could've whipped up some item doodles in just an hour or two, though? All that said, I'm still pretty fond of the Daichi-kun Crisis instruction manual. It's not exactly stellar, but it's also not a total dud. Speaking of not-duds: if you've got the time and interest, I'd highly recommend checking out my "Nice Package!" post on this game. That write-up does a better job of explaining its gameplay and is filled with photos of its packaging.